The beginning of the month saw the tail end of winter. Thus, pushing the postponement of the community BBQ to Saturday 15th September, where the sunny spring weather beamed down. To give local businesses an opportunity to advertise their business, new products, sales, etc at a specified cost. To give local Clubs & Organisations an opportunity to advise meeting times, AGMs, contacts for free. 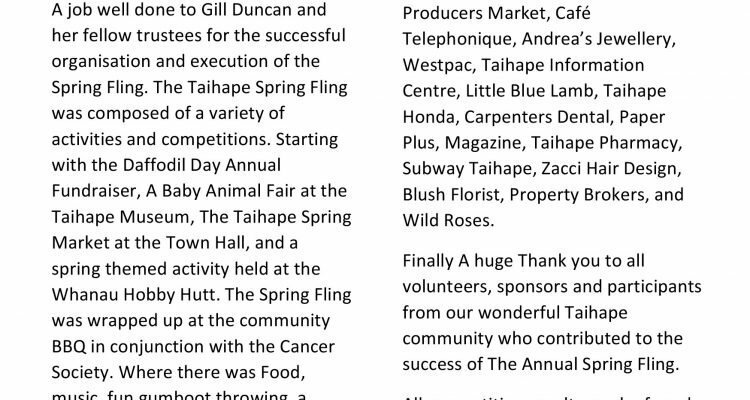 To allow all events in the Taihape Ward, open to the public & organised by any persons, groups or organisations in the Taihape Ward to be advertised (size at the discretion of the TCDT editor). To give local information to community members who do not have access to the internet. To deliver to every home & business in the Taihape Ward. Rates for advertising reviewed every 6 months except for those paid for 12 publications. Businesses are encouraged to develop their own advertisements. The Trust has the right to refuse any article/advertising which it considers inappropriate. The editor may add snippets of information. B&W. There will be no colour at this point in time (printed version only). There will be no reports from clubs or organisations at this point in time. 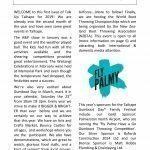 Advertising of businesses, clubs & organisations in the Taihape Ward only. Size of ads according to available space. Out of town events are not eligible to advertise. The TCDT will do a front-page editorial including information about the projects it is involved in, or that it has planned to undertake. The Rangitikei District Council may advertise meetings scheduled for Taihape & any urgent notices ie. Water restrictions, fire restrictions etc. The Taihape Community Board is encouraged to submit a one-page report following their meetings (1 per 2 months). Layout is at the discretion of the TCDT editor. There will be a limit of 32 pages per issue. Advertising will be on a first-in-first-served basis. Deadline for advertising and editorials is the Thursday prior to distribution week. There will be a penalty fee for those that ask for last minute changes to their advert or for late submissions ($20 per advert). Only 1 page per business, per month. No properties for sale to be advertised.